Du bist hier: Startseite / Blog / Startup News / Hamburg Startup Monitor: Results of the first study have arrived! 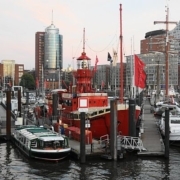 Hamburg Startup Monitor: Results of the first study have arrived! 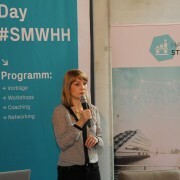 An excited premiere mood pervaded the Betahaus last Tuesday during Social Media Week: Sina Gritzuhn, co-founder of Hamburg Startups, presented the results of a study looking into Hamburg’s startup scene. Now the Startup Monitor treasure trove with its over 450 entries has been enlarged to incorporate a wealth of additional information. And we are perfectly justified to claim: you’ll only find that in Hamburg! 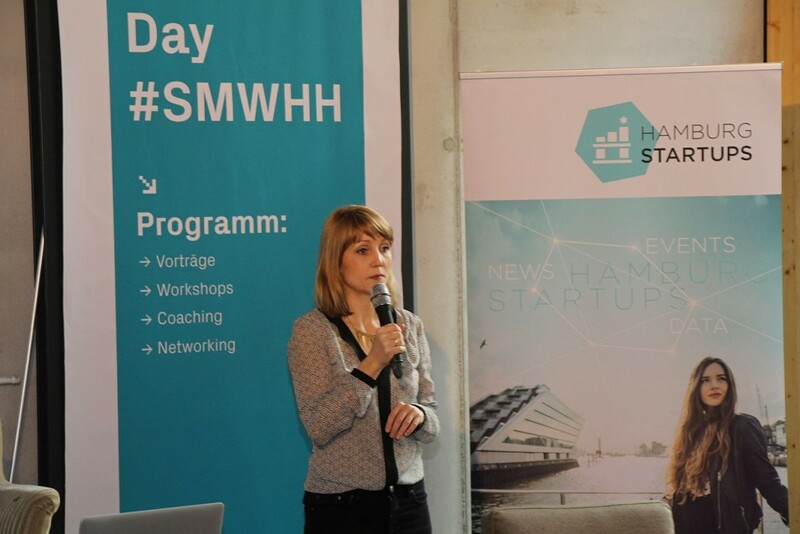 The Startup Monitor by Hamburg Startups is an important instrument for us. The Monitor has been directly responsible for many of the initial contacts with Cybus, whether it is the press, potential investors, accelerator programs or customers. This means that the Monitor can provide answers to many different questions, although it leaves plenty of others hanging in the air. To close this gap, the founders first came up with the idea of conducting a more profound study shortly after the launch. Naturally, though, studies like this are not produced overnight. In actual fact, the real work on designing a set of questions and how they should be worded started as far back as February 2015. The questionnaire itself was programmed in May and June. An intense period of testing with 12 startups then followed. After collation of the results, the optimised version was sent out into the field in August and September. The data has been pre-sorted, cleansed and evaluated since October, and now it has been prepared in a suitable form for public presentation. The survey included data from 214 startups in total, even if they did not respond to all questions. But more on that later. 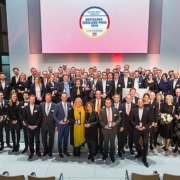 First of all, it is important to define precisely what constitutes a startup: companies aged no more than 10, possessing an innovative business idea and growth potential, and in our case situated in the metropolitan region of Hamburg. Retail is the most popular industry for our founders, accounting for a good 25 percent of participants, followed by media startups (17%) and startups in technology and services (14% each). An immediately noticeable feature of the Hamburg-based startups, irrespective of the industry, is that they are still very young. 58 percent were founded in the last two years, and 34 percent have not even celebrated their first birthday. Evidently, there must be something in the air in the Hanse city that over recent years has encouraged increasing numbers of people to go into business for themselves. The most positive signal included in the study is the buoyant mood it reveals. The “inxperience” of many greenhorn startups must be taken into consideration in the analysis of other results. Indeed, over two thirds respond that they are still in a phase in which the product needs to be developed to market maturity, or in which noteworthy revenue remains to be generated. So it is hardly surprising if almost half the companies have returned less than €10,000 in turnover over the last six months, based on the survey period. Interestingly, just 117 participants responded to what may be a somewhat delicate question for some. Who are these participants? 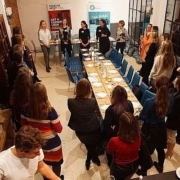 Most of them are still men, and the proportion of female founders stands at just 15 percent. 80 percent have at least one university graduate on the team. Diversity is perhaps the most striking factor in terms of age, and the average of 34.5 years clearly indicates that start-ups are no longer the exclusive preserve of the young. Although the youngest founder is just 20, the oldest has already reached the venerable age of 72. Taken together they wield increasing clout as an important factor on the job market. The FinTech startups stand out in particular here, as their average workforce numbers 30 employees. In total, each startup employs nine people on average. Although this is fewer than the national average, it remains important to consider just how young many of these companies are. Over 70 percent of the 195 respondents intend to recruit new employees in the near future, some of them even significant numbers. 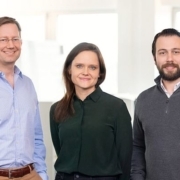 Recent paragons of the startup community like Jimdo, Goodgame Studios und Kreditech have caught the eye of the press and investors, helping Hamburg to become a serious start-up hub next to Berlin. Our greatest challenge? Managing growth – on all levels. New employees need to find their feet, and the structures are changing. Colleagues who have been with us since the get-go feel unsettled, and all the while the pressure to succeed is growing! The diagram above shows clearly: finding suitable specialists – especially in the IT sector – appears to be quite tricky. And the tiresome topic of money vexes startups right from the beginning. 50 participants in the survey made do with less than €10,000 of seed capital to begin with, while at the other end of the scale three companies had their coffers filled with over €1 million when they joined the race. 68 companies declined to comment. The founders put up a large proportion of the seed capital themselves, while friends and family continue to play an important role. And what happened then? We have seen that sourcing capital is the biggest challenge. Almost half of the respondents have not completed a single round of financing. But let’s not forget: this is hardly a surprise, given the early stage of development in which many of the companies still find themselves. Over half of the startups have targeted a round of financing for the coming 12 months, which indicates that things are bound to become lively. The startups are cautiously optimistic when asked about the revenues they expect for the six months immediately following the survey: although 26 of the 116 respondents picked the category “less than €10,000”, 33 hoped to generate between €100,000 and €500,000 and four startups even confirmed their aspiration to make over €1 million in revenue. What we have seen here is just a tiny snippet from the wealth of information contained in the study. A detailed analysis can be found here. And even if the survey is not entirely representative, it does represent an extremely meaningful and unique resource within startup world; no other city has produced a comparable study. 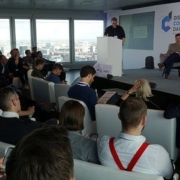 What’s more, the scene continues to develop at a dizzying pace, so it is fair to assume that Hamburg Startups will not rest on its laurels and will instead produce new surveys and refine its methods. After all, the startup scene in the Elbe metropolis certainly deserves more attention and recognition. Many thanks to the partners and supporters of the monitor! SXSW: Cybus und Spottster reiten nach Texas! Code Rouge – so macht FinTech Spaß!